Casa 1 quarto para 2 pessoas perto da aldeia de Frigiliana. É uma casa de46m2 em uma propriedade de 10000m2 com 1 quarto (1 cama de casal). 1 casa de banho com chuveiro. cozinha (geladeira, fogão, microondas, torradeira, cafeteira, máquina de café, máquina de lavar). sala de estar (TV por satélite, DVD, lareira, sofá-cama). O exterior tem um jardim varanda de 1000m2 aprox., Piscina (aberta de 1 de Abril até 31 de Outubro) .Barbacoa. mobiliário de jardim e estacionamento privado. This is a charming (spotlessly clean!) house, full of character and perfect for a couple. The outside space is beautiful and exceptionally peaceful. Perfect for bird spotting (lots of birds of prey flying overhead)! We were greeted by Jesus who was very helpful and friendly. A car is needed but you can also walk into Frigiliana in 45 minutes. We fell in love with the house and location and would definitely return. 10 out of 10! Thank you to Marisa and Jesus for a lovely stay. Muchísimas gracias a vosotros! !!!!! Beautiful views down to the sea. We really enjoyed our two weeks in the sunshine. Peace and quiet here and good for sunbathing, Alternatively there are plenty of places to visit nearby both on the coast and in the mountains. It was still March but the pool was open and we did go in a couple of times although it was still cold; no doubt it will have warmed up by April. We are very happy that you enjoyed your vacation. We want to thank you for taking care of the house. A home from home in paradise! We stayed in this beautiful little house at the end of September for 10 nights and I can honestly say it was the nicest place we have stayed in 14 years of visiting Spain. 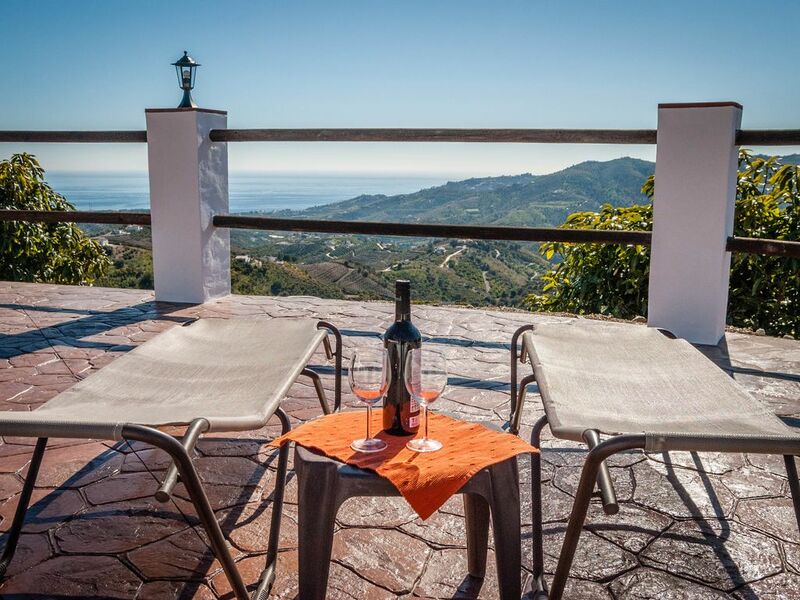 The location has spectacular views over the hills above Frigliana reaching down to the Mediterranean. There is a very large terrace area on the south side of the property with a pool and a veranda. Inside the house there is a bedroom with a double bed, a shower room and an open plan kitchen/ living room. Jesus, the owner, met us when we arrived at Frigliana and brought us to the house. He made us feel very welcome and there was a bottle of wine and some snacks left for us on our arrival. Everything in the house was very clean and smelled fresh and we felt like it was a home from home very quickly. The only downside is that you really need a car if you are staying at this house as there are quite steep hills leading up to it from Frigliana but if this property was in the town itself you would be sure to pay at least twice the price. We felt like we had the hillside to ourselves and when we wanted to go to town it was only a few minutes drive away. We will definitely be staying here again when we return to Frigliana. Prachtig huisje met alles erop en eraan. Fantastisch ingebed in de Spaanse natuur. Hier kom je echt tot rust in een schitterende omgeving. Het mooie witte dorp Frigiliana op wandelafstand, het toeristische Nerja om een 10-tal minuutjes rijden. Goed restaurantje op wandelafstand. Een auto is wel noodzakelijk, al genoten we zo van de rust en het adembenemend uitzicht van de Finca dat we hem met moeite hebben gebruikt. Enig minpuntje, er is geen airco. Maar toch geven we hier 5 sterren want dat weet je op voorhand! De WiFi is top en een dikke proficiat aan de eigenaars Marisa en Jezus voor hun vlotte, behulpzame en vriendelijke service. Wir haben diese Finca für zwei Wochen gebucht. Jesús holte uns am vereinbarten Treffpunkt ab und fuhr uns zur Finca. Ein kleines, sehr hübsch eingerichtetes, gemütliches Häuschen mit allem was es braucht. Die Terrasse mit Pool sehr grosszügig und die Aussicht auf die Berge und das Meer, einfach fantastisch. Und diese Ruhe! Wir genossen die 100%ige Privatsphäre. Umgeben von Mangoplantagen, Olivenbäumen usw. Die Bilder lügen nicht. Es erwartete uns sogar ein Willkommensgeschenk: Eine Flasche Wein, Wasser und eine süsse Leckerei. Jesús und Marisa sind sehr freundlich, unkompliziert und hilfsbereit. Einmal, als wir mit der Wasserversorgung ein Problem hatten, Jesús stand in kürzester Zeit da und reparierte den Schaden. Für den Aufenthalt benötigt man ein Auto. Das wunderhübsche Dorf Frigiliana erreicht man in 10 Fahrminuten, Nerja mit seinen riesigen Einkaufs- und Shoppingmöglichkeiten in 20 Minuten. Für uns war dieser Aufenthalt Erholung pur. We loved this place so much. The patio/pool area had amazing views, the pool was big enough to dip in, cool off and play a few games, the BBQ area was great. Inside the house was well stocked with pans/cutlery etc and plenty of towels were provided. All contact with the owners Marisa and Jesus was easy and they were very friendly. Highly recommend and we will be back! We are very happy that you have been well at home Alba. Our goal is that the clients are the best possible in our property. Thank you very much for taking care of the house. Desfrute de uma casa rural ideal para casais. Ele está localizado a 2km a partir de Frigiliana uma das mais belas aldeias brancas da Axarquia. Eles podem ir para agradáveis ​​passeios na área circundante. As praias mais próximas estão a 8 km localizados na cidade de Nerja. Esta casa enfrenta o sul, foi construído em 2007, é facilmente acessível e que a pista é pavimentada. Tem vista para o mar e montanha. É composto por 1 quarto, 1 casa de banho, sala, cozinha (equipada). O exterior tem uma varanda de 6m2, um jardim de aprox 1000m2. Pool, 1m de altura e quatro de diâmetro, churrasqueira, móveis de jardim e estacionamento privado. O contato é feito diretamente com o proprietário. As reservas são feitas por transferência bancária um depósito de € 100 como um depósito. Na entrada para o total da semana ou semana e se ele sai tudo certo irá devolver o depósito de 100 €. O preço inclui a limpeza da casa na entrada e vestuário, e piscina serviço de limpeza duas vezes por semana. Eles têm um presente de boas vindas. LOS CLIENTES PAGAN 100€ MEDIANTE PAYPAL PARA HACER EFECTIVA LA RESERVA. ESTOS 100€ ES EN CONCEPTO DE RESERVA Y FIANZA. EL TOTAL DEL ALQUILER SE PAGA CUANDO LLEGUEN A LA CASA. LOS 100€ DE LA RESERVA SE LE DEVUELVE AL CLIENTE A LA SALIDA SI TODO ESTA CORRECTO EN LA CASA.